The Plaza Catering - 50 and FAB! Since 1965, The Plaza Catering has been serving quality food and providing excellent service for all kinds of occasions – from the simplest home parties to celebrating important milestones.Today, The Plaza Catering celebrates its golden year. That’s 50 years of timeless and signature dishes that have captured the hearts of Filipino diners and foreigners alike. And since it’s The Plaza Catering’s 50th year, it is just but fitting to come up with new dishes, an exciting new menu and amazing promos. Just recently, The Plaza Catering invited us over for a pre-anniversary dinner. Headed by the mother and daughter tandem, Millie & Karla Reyes, I was pleasantly surprised to discover that they actually prepared a full catering set-up – just like how they do it in their events. While waiting for dinner, I tried some of their Amuse Bouche. The Smoked Salmon Pinwheel and Prosciutto wrapped Asparagus are both winners! For Mains, I filled my plate with some Smoked Tanguingue. Perfectly cured and lightly smoked. You can eat it with dill mustard sauce, onions, chopped eggs, lemon and capers. Followed by Chicken ala Kiev. If you haven’t tried The Plaza Catering’s Chicken ala Kiev, you are most definitely missing out on some seriously great tasting chicken. For butter lovers like me (I can be selfish when it comes to fresh butter), this dish was a beauty! When Karla sliced the chicken in half, the melted butter that was just waiting inside slowly oozed out! What a delight to see! The butter which beautifully coated the perfectly fried crispy chicken breast gave this dish additional oomph! For carbs, I opted for pasta instead of rice. Lo and behold, this Garlic Chorizo on angel hair pasta captured my heart! This is a culinary masterpiece by Chef Olaf Gosto Petterson – a gastronomic delight that I grew up eating especially during Christmas. The Plaza Catering’s Premium Baked Ham is cured, smoked and baked, making it sweet, salty, smoky and all sorts of wonderful. The caramelized sugar adds a great texture that can make anyone go crazy! Hot pandesal please! And some Christmas carols on the side. The Plaza Catering’s Premium Roast Corned Beef is prepared four ways: boiled, roasted, smoked and pastrami style. Eat it with horse radish or as is. After a deliciously filling dinner, close it out on a sweet note. The Plaza Catering’s Croquembouche, true to its meaning, literally “crunches in the mouth”. The choux pastry with threads of caramel is just so addicting! The Plaza Catering’s Premium Baked Ham is also available “to-go” by visiting their branch at the ground level of SM Megamall Bldg. A (in front of National Bookstore). I highly recommend you try their Ham Sub. That’s a 10″ pandesal, stuffed with The Plaza Catering premium baked ham and their amazing premium glaze. Look at that beauty! But they have other offerings, too like the classic Hamwich. 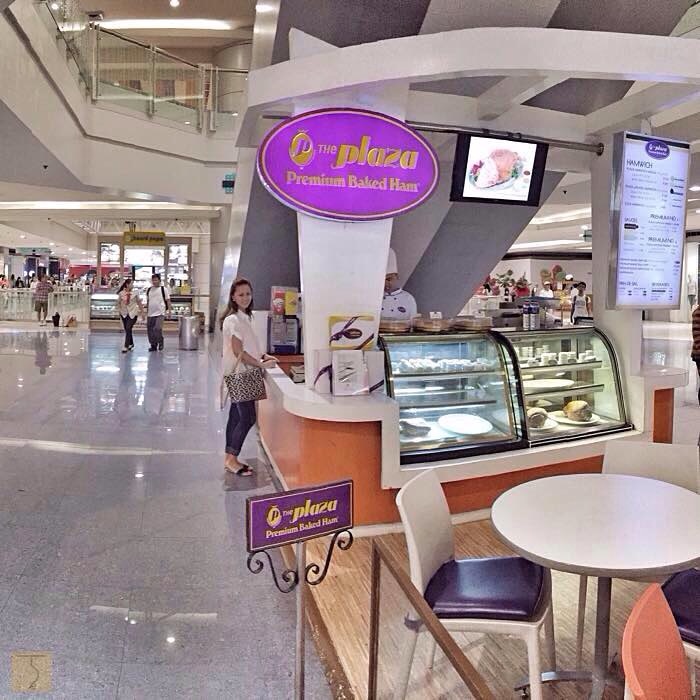 The Plaza Catering’s Outlets: Petron Dasmariñas, Petron La Vista and Rustan’s Makati. I have been to events that The Plaza Catering has catered, and I just have to say that their food, quality and service is still top notch! They serve up the kind of dishes that leave you raving and talking about it long after you’ve digested them. Truly, The Plaza Catering is a true legacy of food excellence. Cheers to your 50th and beyond! You are Here >> Home » Food » The Plaza Catering – 50 and FAB!